Making plans for summer vacation? Planning to pack light to avoid those extra baggage fees? Thought so. Well here’s another “traveling light” idea that will make you one happy traveler. 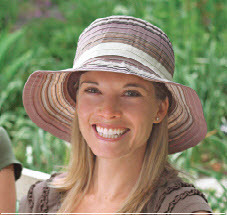 Wallaroo Hats, based in Boulder, Colorado could be all you’ll ever need to pack. And yes, I did say pack. These amazing creations are just made to roll-up, scrunch, squash or however else you want to abuse them. Now there’s no more reason to avoid taking that head protection you really need. Stuff it in your purse, your backpack or your suitcase. It’ll be ready to wear the minute you pull it out. Did you know that scalp burns is a major cause of melanoma? You really need to protect that dome of yours, and Wallaroo does it so well. Their hats provide an Ultraviolet Protection Factor of 50+, blocking 97.5% of the sun’s UV rays. But, for that protection do you have to give up fashion? Never! The women’s line has over 24 styles. Men get to choose from about 9 and kids have another dozen. Whatever the look you are going for, chances are pretty good you’ll find something that works. Best of all, they are very reasonably priced. So what makes them so special – besides being healthy for you? My wife got the Nantucket model right before we left for seven days on a clipper sailing ship in the Caribbean. We sailed to seven countries in seven days and every day the sun was out – in full force. With a combination of the sea breezes and the speed of our vessel, more than one hat was seen blowing across the deck. Not the Nantucket. Inside the rim of the hat, Wallaroo has cleverly sewn in a drawstring so you can snug the hat up to your head if the wind is a problem. No wind – loosen the drawstring for a looser fit. The brim is also an amazing feat of hat technology. Fold it up, fold it down, give it a pleat, whatever you do, it holds that shape. Sun coming from low on the horizon, fold down one side and flip up the other to enjoy the breeze. If it were to start raining, aim the brim down on the sides and back to let the water roll off. It’s a cliché, but you won’t believe it until you see it in action. Check out all the models and colors on their website or at a retailer near you.